Ending December with a Bang! 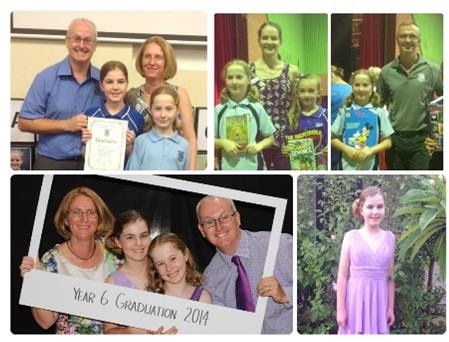 Well the school year finishes tomorrow and 2014 has ended rather well for us. 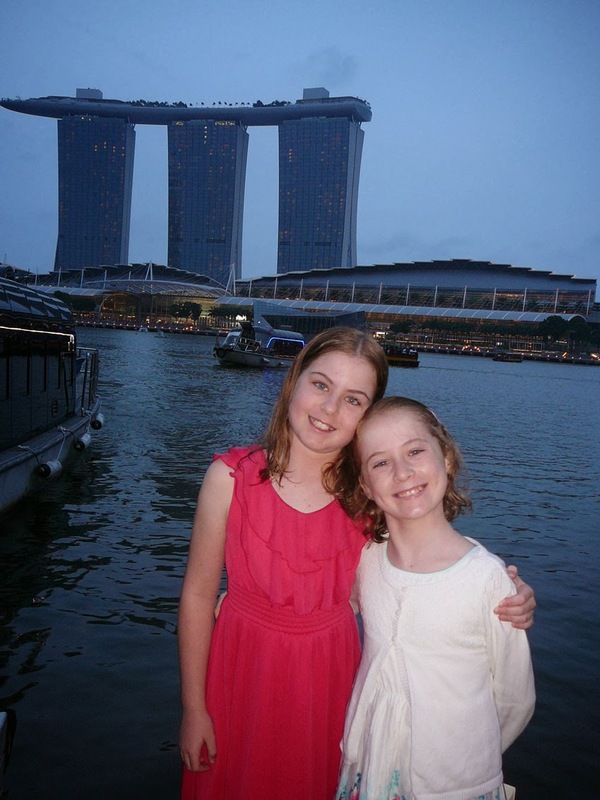 Grace graduated from year 6 last week, bring on high school next year! She had a dance on graduation night, so we all got dressed up for that. Then the morning after that was the final whole school assembly for 2014 and Milly scooped up the Citizenship Award for her class as well as an award for music. She did extremely well, we are very proud of both of the girls for a fantastic year. Nothing like a friends birthday to inspire you to finish the binding so you can give them a table runner for their present! Happy birthday Mandy! WIP Wednesday - A Finished Quilt Top. 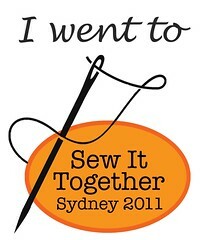 I think my sewing mojo may be returning. Fingers crossed.... 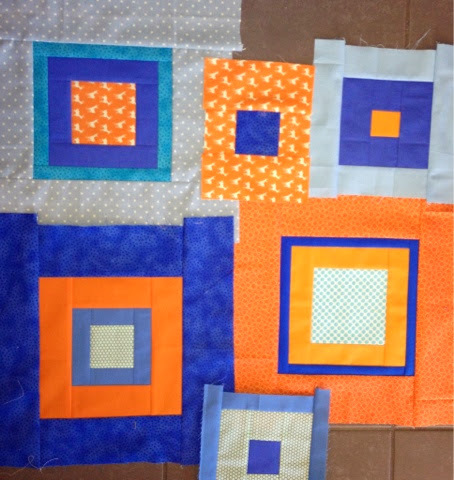 I have finished the quilt top of the blue and orange squares started back in. I have some blue scraps left over for the backing. 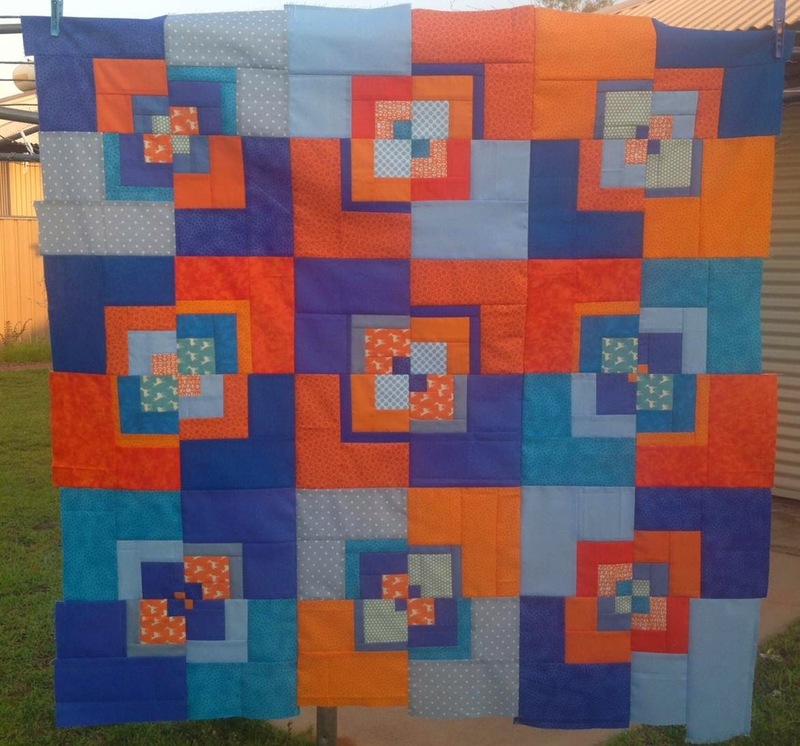 It measures about 36 inches square, perfect for the lap of a baby boy due just before Christmas. Holiday Sewing - A Cuzco Runner. I managed some sewing in the school holidays just passed. 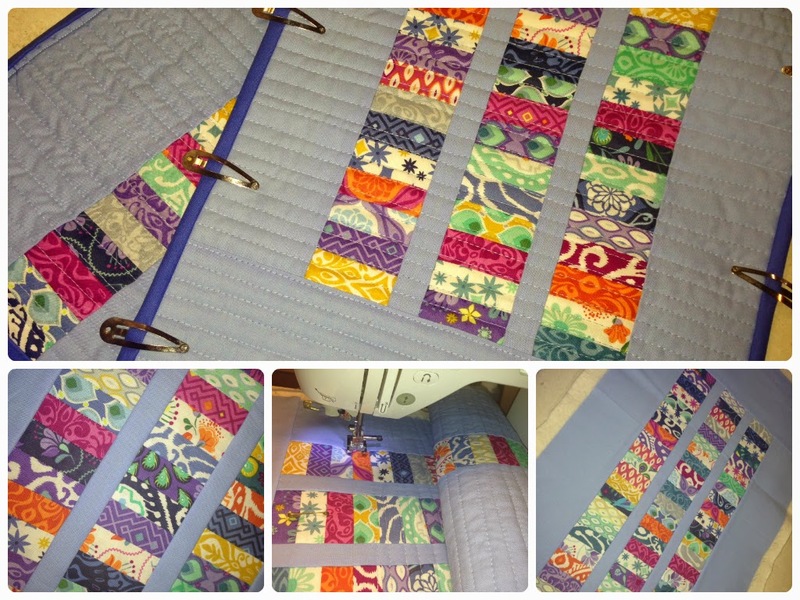 I had already sewn these mini charm squares (Cuzco by Kate Spain) into rows, after cutting them in half. All I had to do was add the sashing, sandwich it and then quilt it. Tick, tick, tick! Then add the binding, another tick. And now it has been sitting ready to hand sew down for over a week. At this rate it will sit there until the next school holidays! I finished the binding on this runner just in time to enter it in the local Ag Show last month. It picked up a second place for "Quilted Other Item". I pebbled quilted it, leaving every sixth row of colour not quilted so it would pop out. Mum admired it when she was visiting, I think I will send it down for her birthday in October. Wow, my first finished item for 2014!! 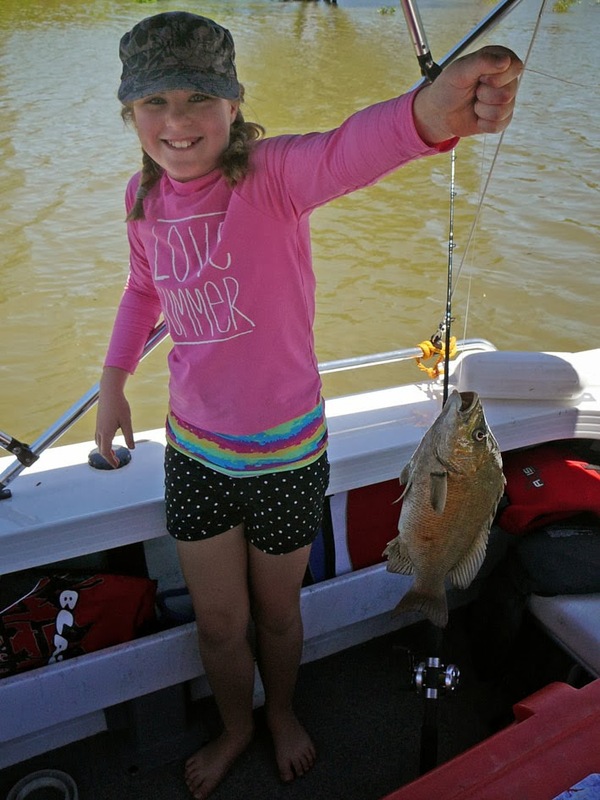 There is not very much sewing going on here at the moment but there has been a bit of fishing..... On the last week of the school holidays we had an overnight fishing trip with friends to a top secret destination. 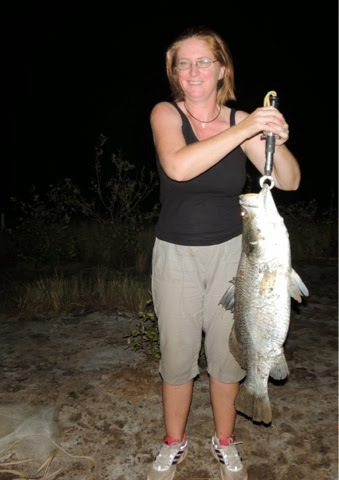 All destinations are top secret when it involves catching barramundi! 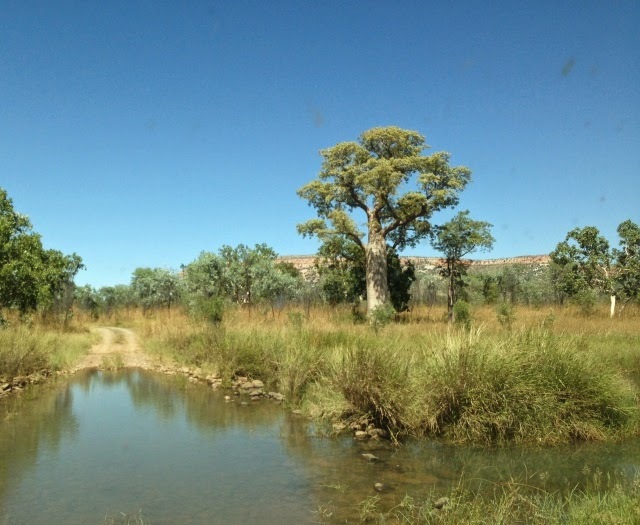 We drove through a few water crossings like the one above. It was a long drive and Grace much preferred a nap in the shade of the car to doing any fishing! Milly however was on fire and caught this cat fish which she wasn't impressed with. "Gross Mum!" 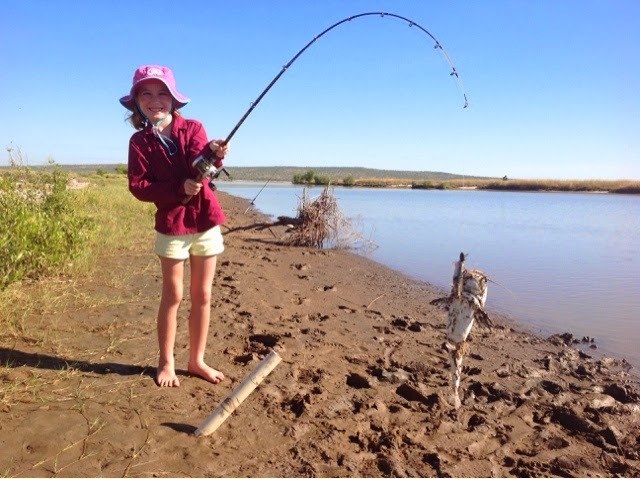 She persisted and then later her line went off and she reeled in a barra all by herself. Daz was giving instructions, "wind in, pull up, pause, wind in, pull up, pause" and Mr D had the net ready, we were not letting him get away. 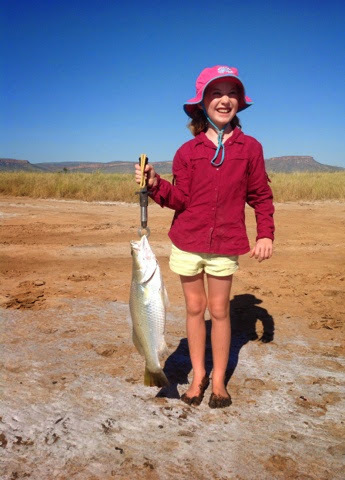 Here is the end result, a beautiful 59cm barra and a smile that says it all. Well done Milly! 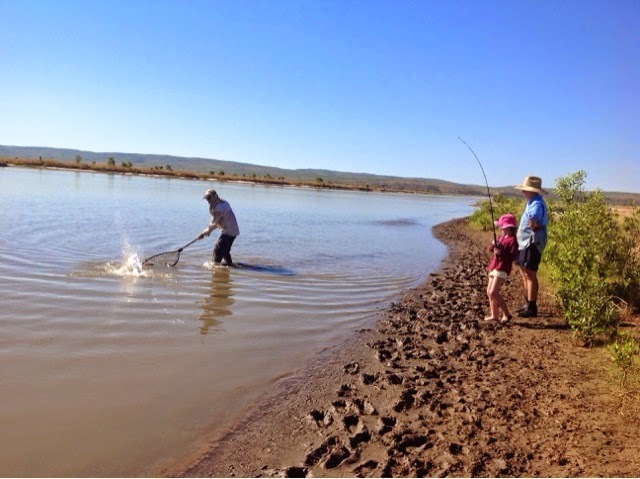 Three Fishermen. This photo shows their interest, Milly is still looking at her fish and Daz and Mr D are looking down river at where the rods are thinking they heard another one go off. And I am saving the best photo for last. After the sun went down and the kids had gone to bed in the tent, my rod went off and look what was on the end! How big is that barra? 80cms long to be exact. It was very heavy, my arms from reeling it in and then holding it up for the photo. 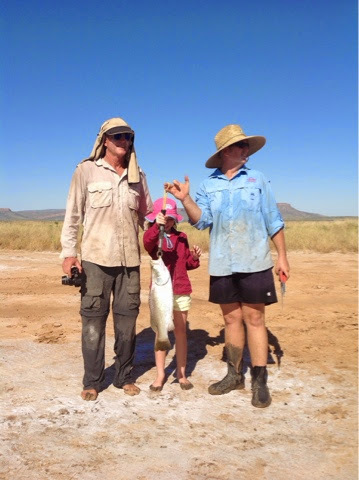 It was the best feeling though, I caught an 80cm barra. Not a bad end to the school holidays despite there being no sewing! 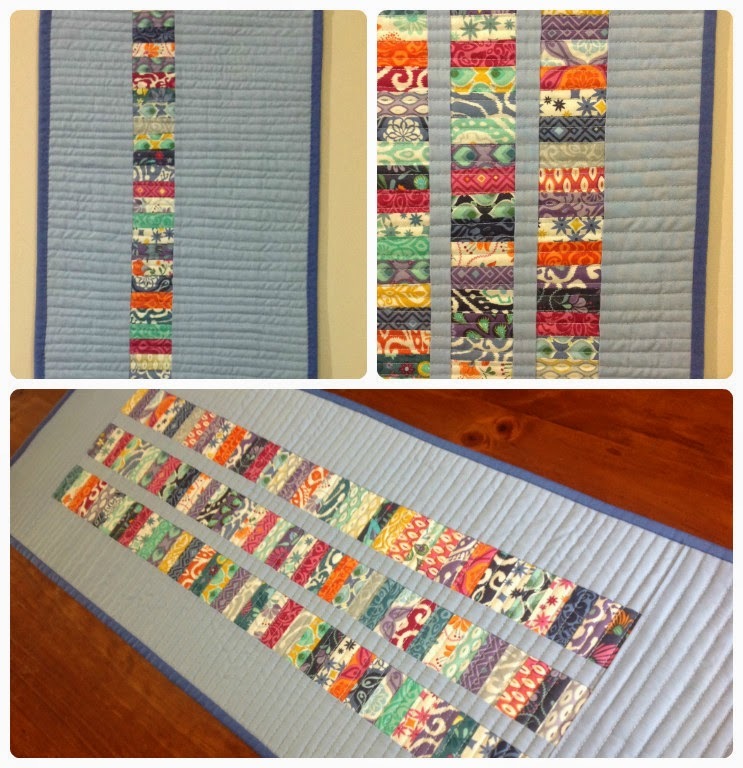 I have sandwiched my bargello runner completed at the retreat from last month and have started quilting it. I was thinking straight up and down stitch, but I always do that so I went for some pebble quilting instead. I'm doing a pale cream/yellow for the lightest six blocks and a variegated red for the remaining darker four blocks. It's not the neatest but I think with this pebble style of quilting, it doesn't really matter. Happy Worldwide Quilting Day everyone! 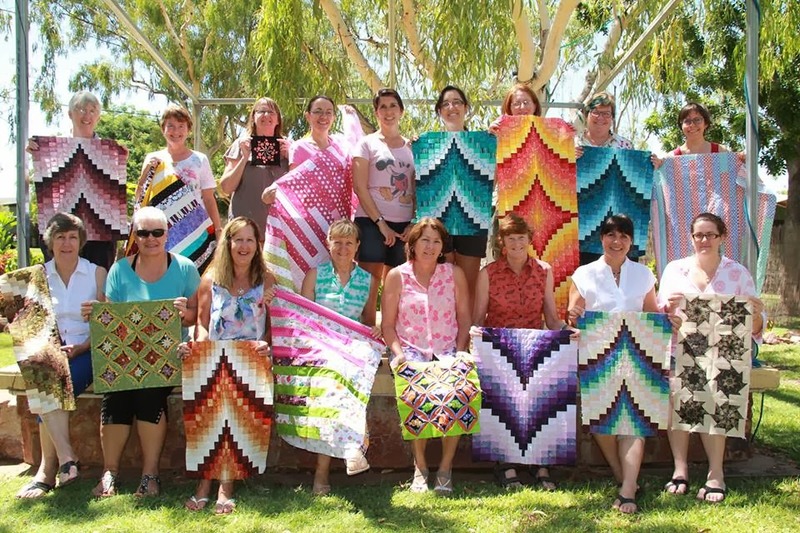 I went on a quilting retreat on the weekend with the ladies I sew with in real life. 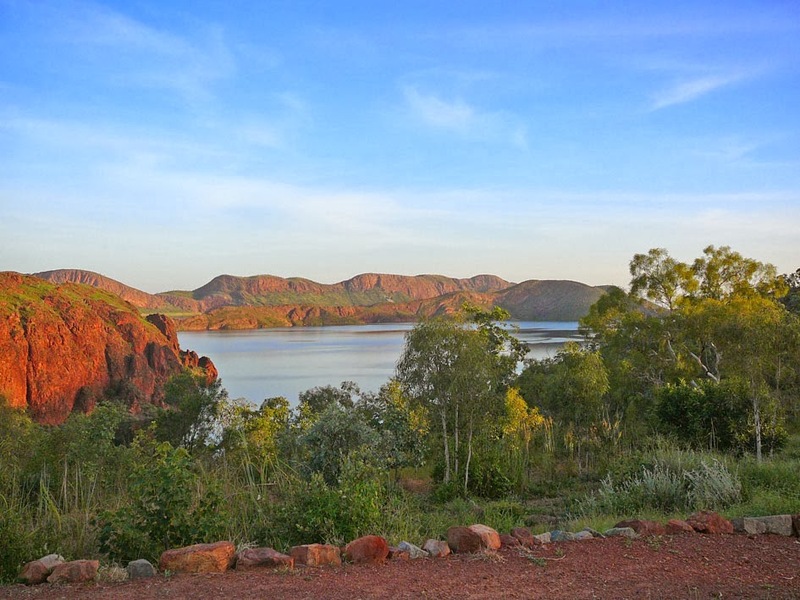 We threw around the idea back in November and as always it takes awhile to organize but we packed up our machines and headed to the beautiful Lake Argyle on Saturday. This was the view just from our cabin. It was our 10th wedding anniversary on Saturday so I thought I better drag Daz and the girls along too but they went out on the boat for the day with friends while the ladies sewed! 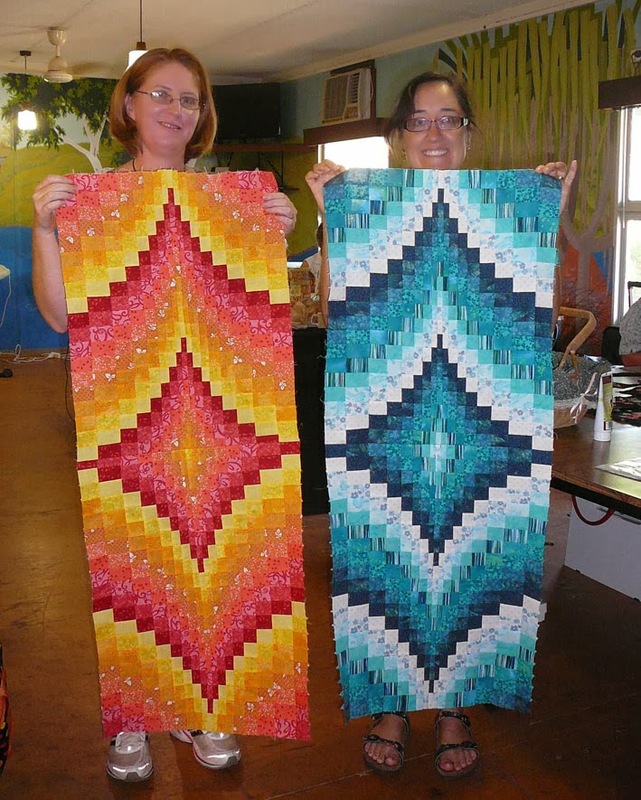 We were doing a bargello runner. The strips had been cut a few weeks earlier. Here is my view for most of the weekend while inside. Concentrating while cutting and unpicking the strips ready to sew back together.... Don't chat to me while I'm cutting! Here we all are on Sunday with our projects. Some ladies worked on cathedral windows or kaleidoscope blocks. A jelly roll race was held on Saturday night after a few wines.... I didn't do that one as I don't want to break open the only jelly roll I have! Wish I did now though cause they turned out pretty well. Here is my friend Nardia and I with our finished table runners looking pretty pleased with ourselves on Sunday. You can't tell some of our seams don't match up from this distance! And while we were sewing, Grace was catching brim. A productive weekend all around! I have finished sewing 20 "circles or 80 quarters to make 20 circles. I have 16 blocks cut to make 4 squares for the centre circle blocks. Does that make any sense??! We have had a bit of excitement in our little town over the last few days, we got flooded! It started on Thursday night, we woke on Friday morning to the above view of our backyard. It's been like that before. We got ready for school but I packed the girls a towel each in their bags and shoes were in their bags too, we all went to school with bare feet! And the rain just kept on coming! A river started flowing through school. Grace's classroom is in the building on the very right, you can just see it's pillar. This is the river a little bit further down from the previous photo. Students started leaving at noon on Friday, the girls and I left spot on closing time at 2.10. Daz stayed longer to assist with kids that weren't picked up. This is the school car park! It was getting pretty bad here. Note you can't see the road in the background! We drove through this! Grace was taking photos with the phone. Someone has put some amazing footage on YouTube here. We got home fine, our house was fine, it kept on raining, Daz got home at 3.30, we made a curry for dinner and went to sleep with rain on the room. 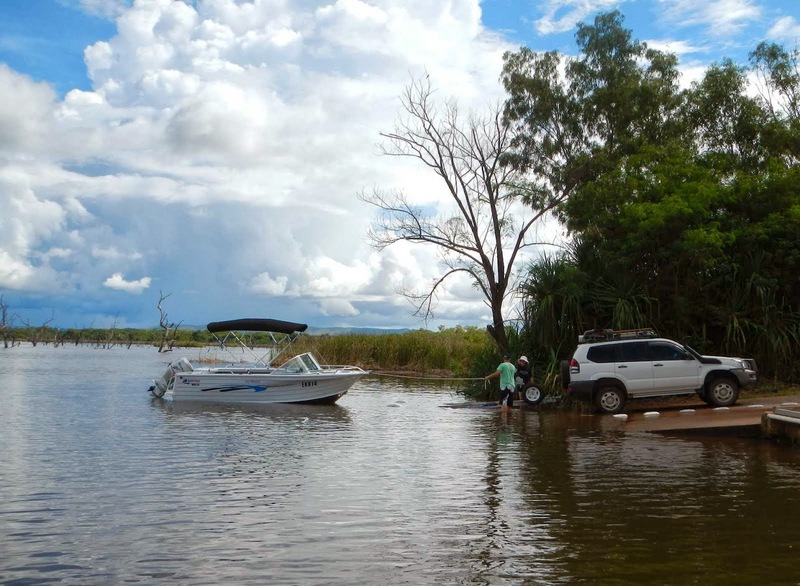 It rained 163mm from Friday 9am to Saturday 9am. Here is the Dunham River flowing quite quickly! Back to school today for the girls. Grace is in year 6 and Milly is in year 4. Can you tell they are happy to go back??! It should be an awesome year for both of them. The lovely Sandi was so kind as to offer me several suggestions about what pattern to sew with the material that I had featured a few blog posts ago. I followed her links and somehow found myself on someone elses blog and then another blog and a pattern site, then another, I got lost in a maze! But I did come up with an idea for the "wonky Circle Quilt". So I cut out some squares, put a new blade in the rotary cutter, watched a "how to sew curves without pins" video on Youtube and pretty soon I had all these blocks. I had in the back of my head that sewing curves was really hard but these were so easy! I think the trick is lots of starch. After laying all these blocks out I figures I want to do four large circles in the middle and then these ones around the outside. Back to work tomorrow, that holiday just zoomed by. We fitted a lot in, first stop was back to Perth. 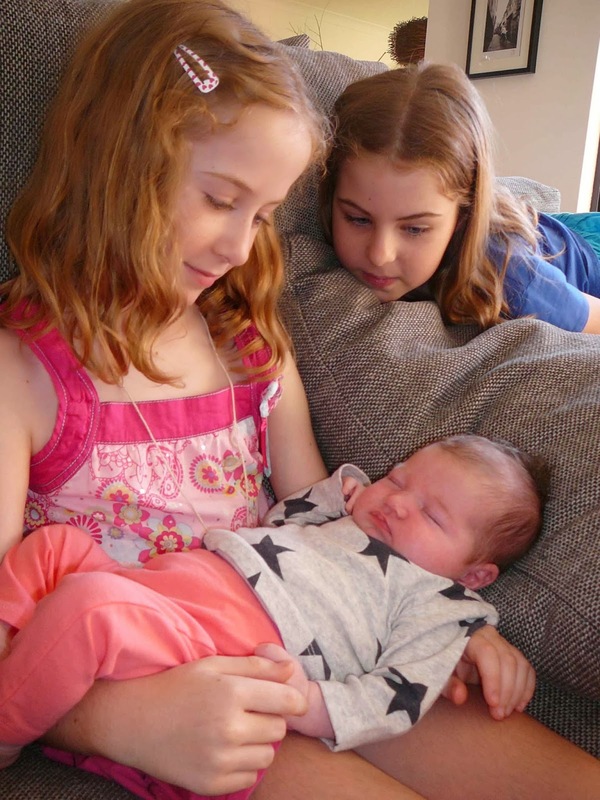 One highlight was meeting our beautiful niece/cousin, only 5 weeks old. We were all smitten with her. Then after Christmas and New Year, Daz and I left the girls with their grandparents and went over to Tasmania for a friends wedding. 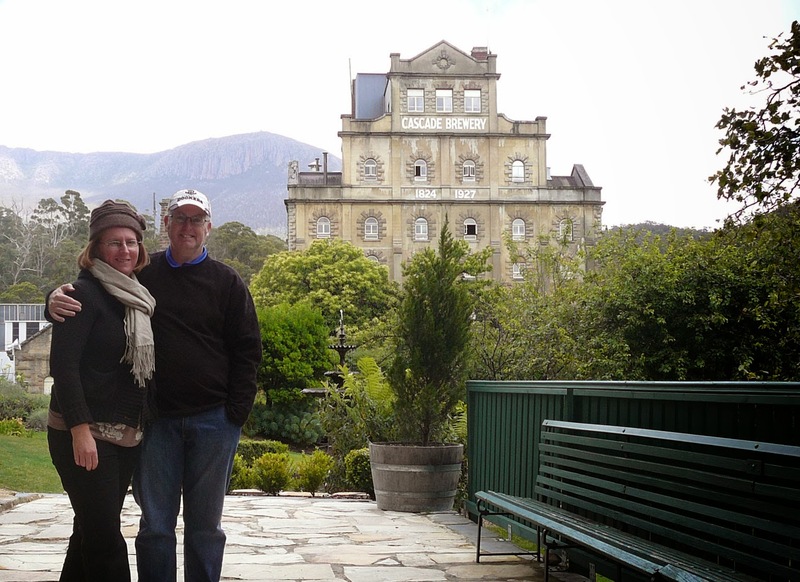 Haven't been to Tassie before, so we did some touristy things like visit the Cascade Brewery. It was cold though, 17 degrees on average, I had to buy a beanie!! But the cold was a novelty for us as we are so used to the heat, I loved wearing a scarf again. 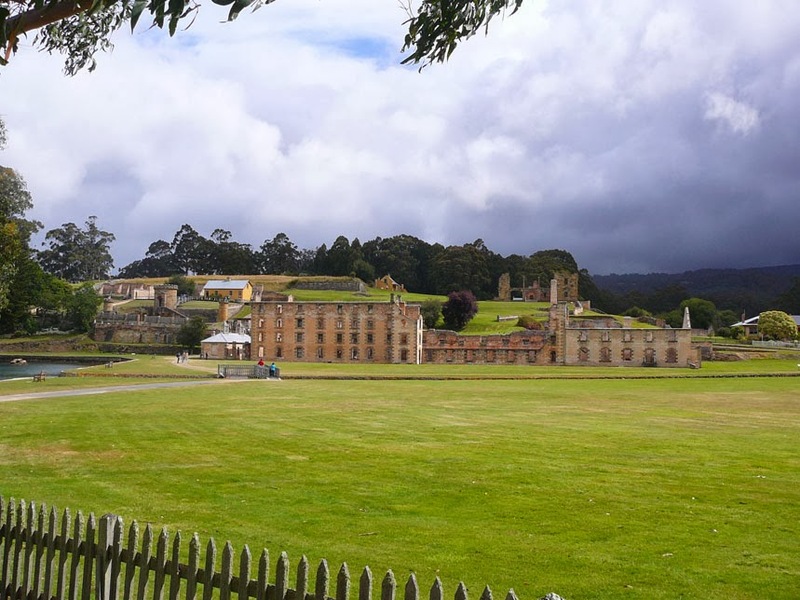 We hired a car and went to the historic Port Arthur. It was a great break away, haven't traveled without the girls for that long a time, it was different! And the wedding was beautiful, it was the marriage of two teachers we work with, so it was very special to travel 4,000kms to attend. 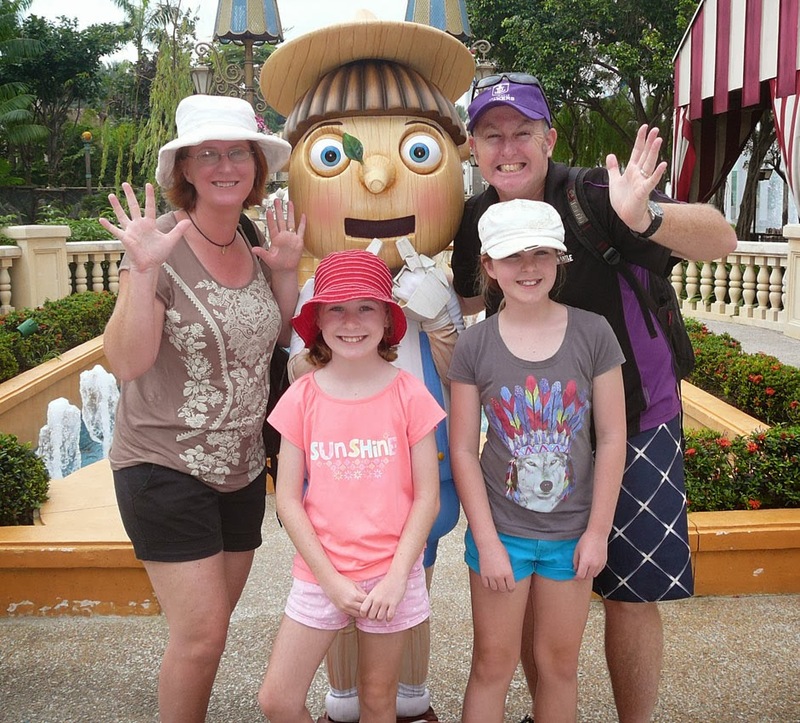 Then it was back to Perth for two days and to pick up the girls and head to Singapore! Bit different to our usual relaxing by the pool Bali style as there is so much to see and do. 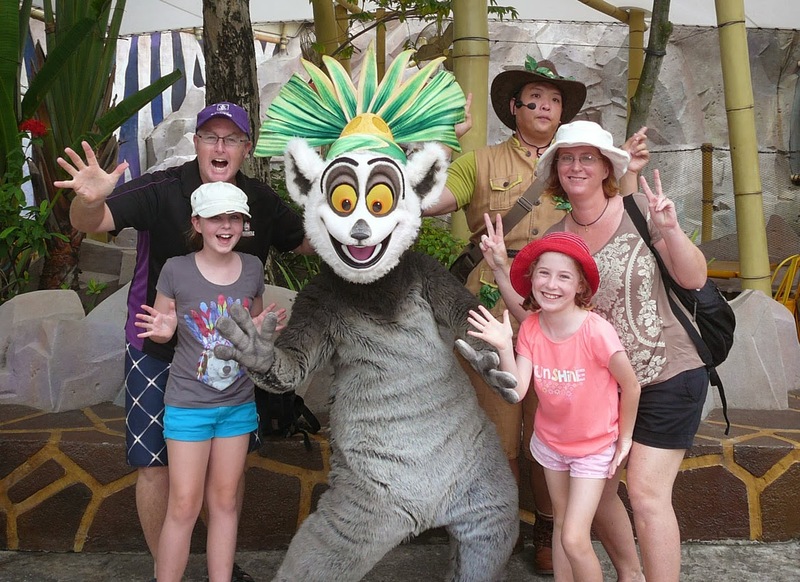 We meet some locals. Milly was stopped three times and asked if she would mind being in a photo! 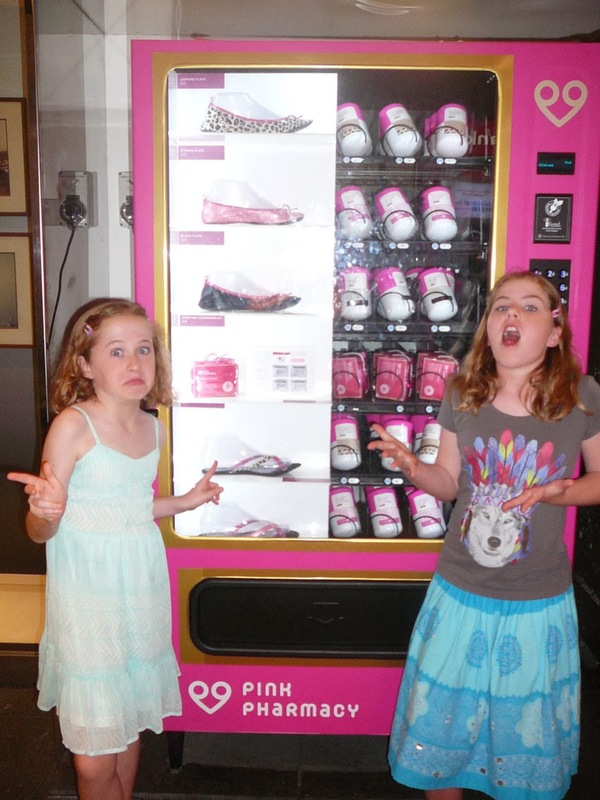 We also found vending shoe machines, handy! 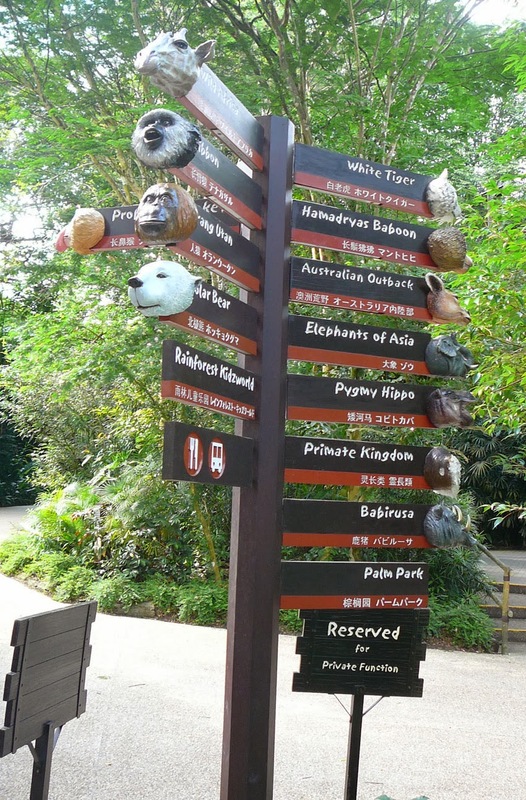 We spent a day at the zoo, I loved the signage there. I guess an animal face is universal in any language! 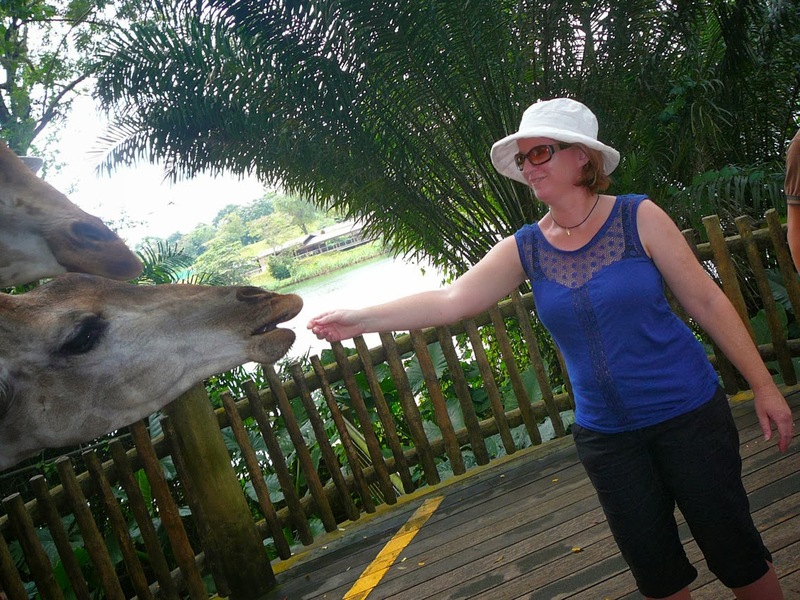 I got to feed a giraffe! 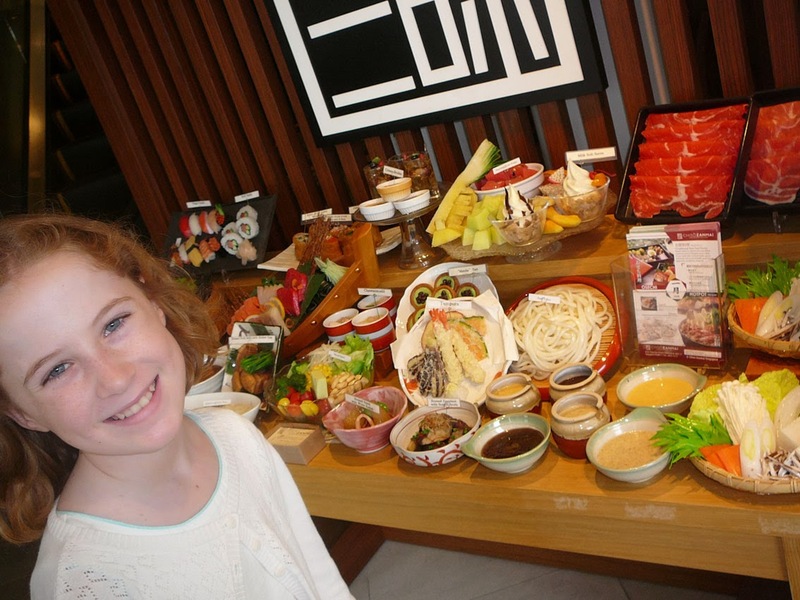 Milly quite happy to pose with the food here because it was a plastic display out the front of a restaurant. Her taste buds aren't that adventurous. I have another photo of her eating sushi and her expression is priceless, like she was eating a poisonous poo or something equally as horrible. 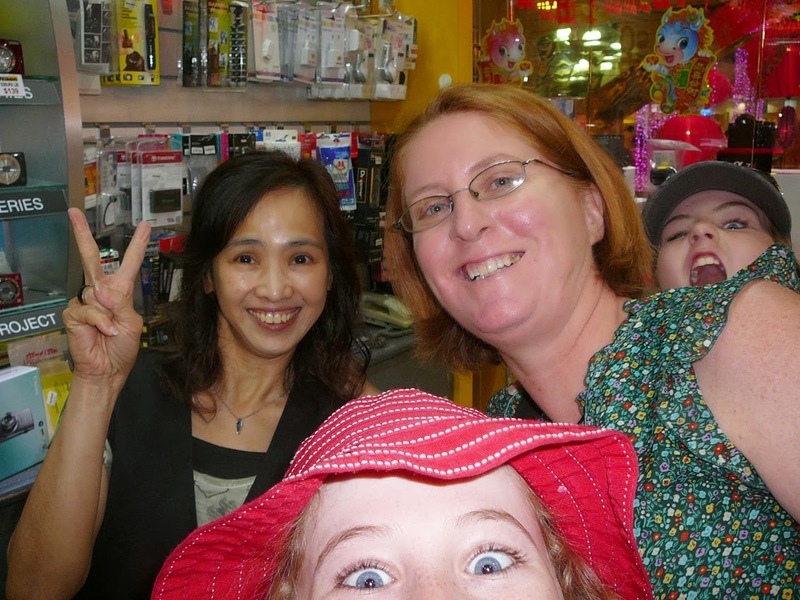 This lovely lady sold us a new memory card for our camera half way through the trip. We just had to take a photo to see if it worked ok! 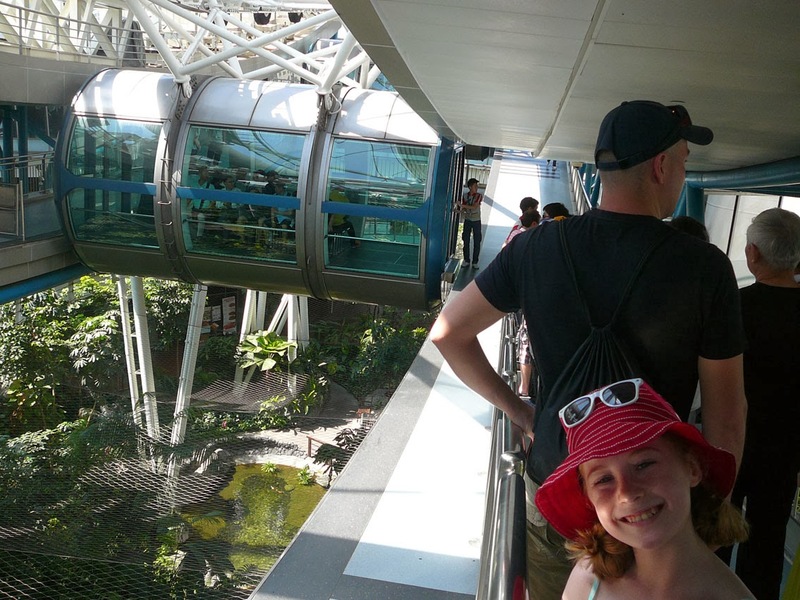 Milly all smiles before getting on the Singapore flyer, a big enclosed Ferris wheel, sort of like the London Eye. 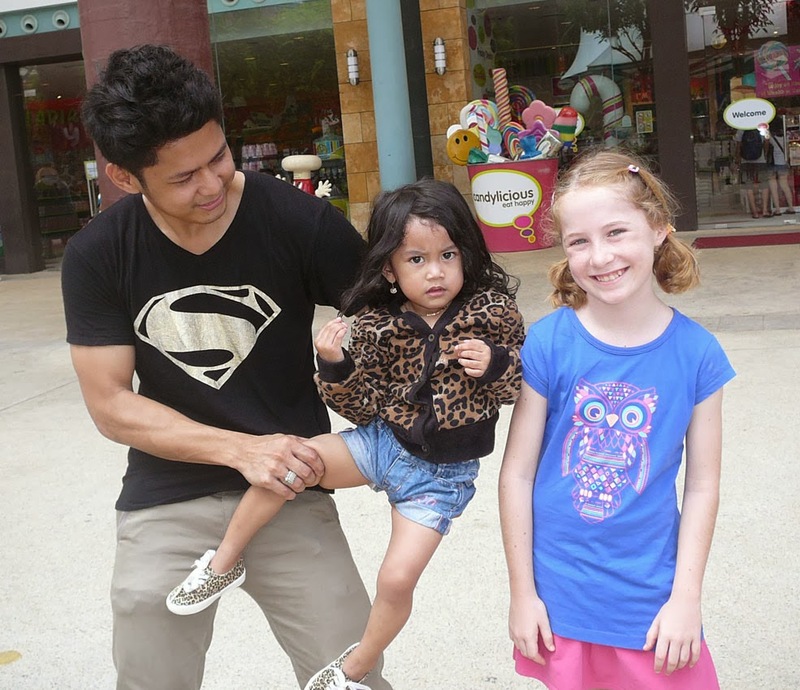 And we got to go to Universal Studios! 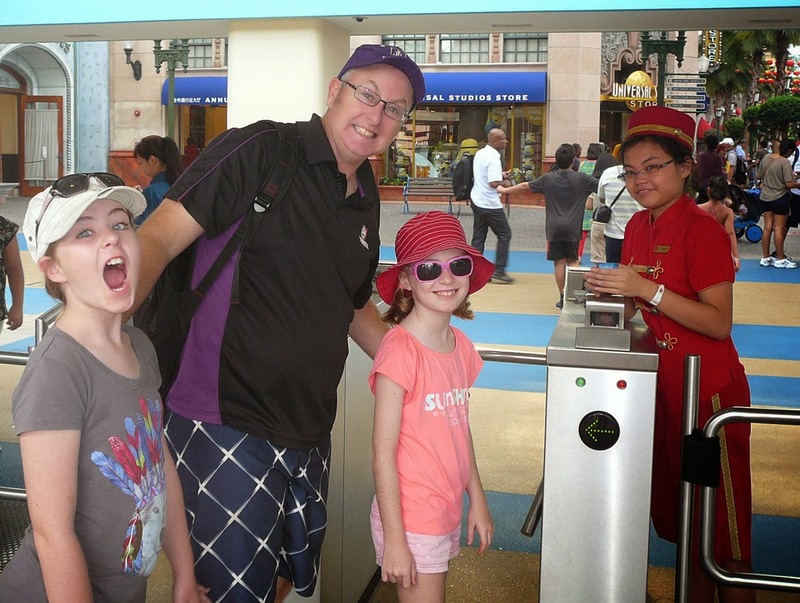 Here is Daz and the girls posing in front of the Universal globe the day before we actually went. The moment we walked through the gate! 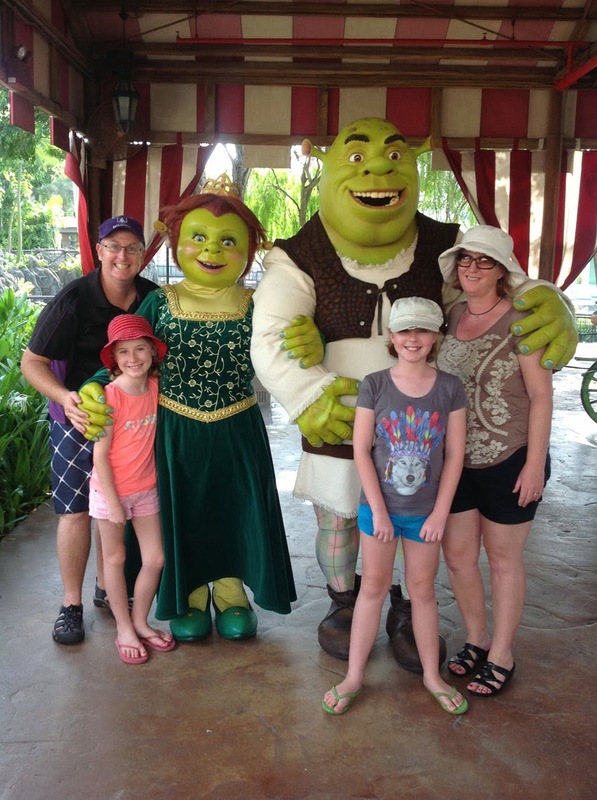 And also Shrek and Princess Fiona! 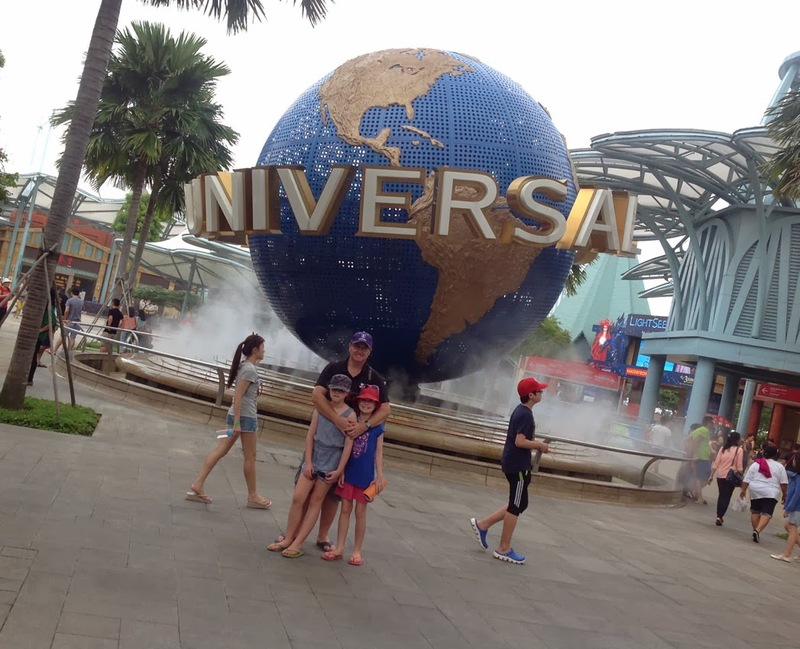 It was a great day at Universal Studios, we were there for 9 hours! We got our tickets upgraded to Express, so we went straight to the front of every que, that was nice! 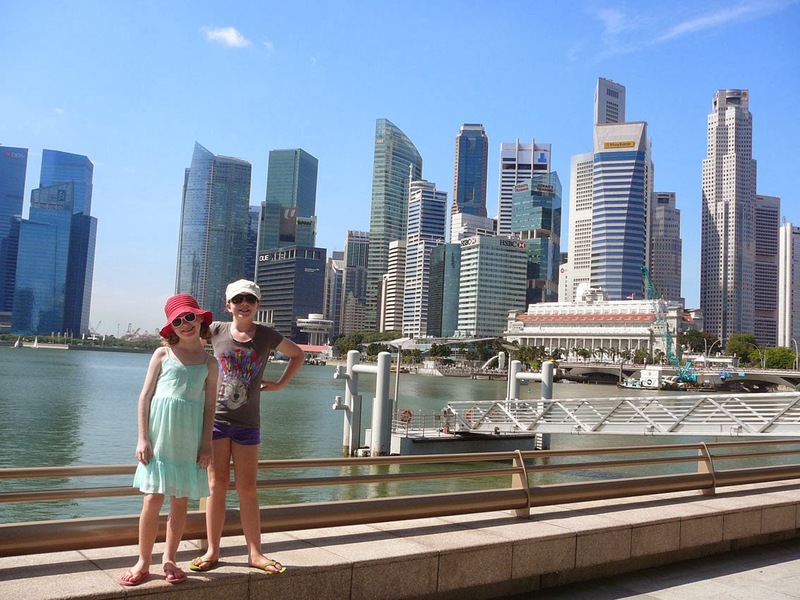 This one was taken on our last night there, we were about to board the water taxi (the boat just in the left of the shot) to take us over to Marina Sands, the three big building in the background with a curved boat on top! 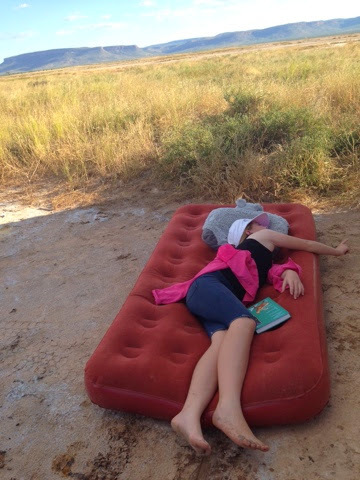 So an action packed summer holiday, all ready to hit the school year now.